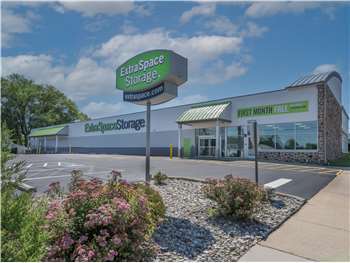 Extra Space Storage is located on N. Black Horse Pike and Wilson Ave. next to Goodwill. With close access to I-295, we're an accessible self storage solution for residents of Bellmawr, Haddon Heights, Barrington, Mt. Ephraim, Runnemede, and Audubon. We're also accessible for residents of nearby apartments, such as Willow Glen Apartments, East Browning Apartments, Oak Ridge Apartments, and Hyde Park Apartments. Whether you need residential storage or commercial storage, Extra Space Storage in Bellmawr has the storage unit size, amenities, and security to handle your unique needs! We offer storage units ranging from locker-sized 3x5 units to large 10x30 units. Units also come with amenities like reduced height, first-floor access, elevator access, and climate control. Not sure which unit size will work for your needs? Reach out to our staff and they'll help you determine what will work best! They have decent storage units. For the price they are not worth it. My rate just went up after 6 months without notification. I don't like how they control the hours of access which is a big inconvenience. I only came back due to a lawsuit voucher I received. Extra Space Storage is one of the best storage places that I have used (and I've used many). The units/building is very clean and organized, the loading dock is easily accessible and makes loading/unloading the truck very easy, not to mention all of the hand trucks that they have available for you. Also, the people that work there are very professional, friendly and knowledgeable, which helps when you are going through a stressful thing such as moving. Make sure that when you no longer need to use the unit you use it up to the day of the month you have it too. I guess I didn't realize it and I moved out 14 days before I had to and I wasn't given any money back for the days I didn't use the storage unit. Not a way to run a business. Read your paperwork carefully. There are other facilities cheaper and just as nice. I've been a customer since November 2011, please consider the Bellmawr, NJ ESS facility. The building is well kept and the staff is AWESOME. It's a great choice for storage. Very clean and very secure. I've been a tenant at the ESS in Bellmawr, NJ for quite sometime and I can't say enough good things about the facility and the staff. Top notch! The staff go out of their way to help you. Consider ESS in Bellmawr, NJ. Excellent customer service, great prices and very clean facilities. Don't go anywhere else! First time renting a storage locker and I was a little hesitant about the whole thing. I wanted something safe, clean and somewhere where the staff were helpful and knowledgable. I couldn't have picked a better spot. The team were great and they helped me find the perfect unit at the perfect price for my budget. My entire experience was great. Very clean facility, professional & helpful employees, easy to understand instructions, convenient... all around great place. My only complaint would be that I didn't get an explanation of what I was being charged for the day I opened the account until I was ready to sign, but even then I was extended an apology & a break down of what I was charged for. I have used ExtraSpace for both long-term and short-term storage. I have always found the staff helpful. The outside facilities and inside storage lockers are clean and safe, and well-lit ; big plus for personal safety and peace of mind. Try it. You'll feel well-served and comfortable at ExtraSpace. The Bellmawr Facility & Staff are Clean, Pleasant, Safe & Professional. Paulese and Ashley were awesome. I searched high and low for a facility that would fit my needs and this place won by a long shot. They have high tech security, great access hours, they both work with you and are very understanding, and the site was the cleanest I've seen while doing my search for a storage space. Highly recommend. the whole experience at EES was wonderful.The site mng.Paulese was quite knowledgable about all phases of the operation. We used your free truck which was clean & all went good w/that.I will be pleased to recommend your co.Kudos to Paulese!!!!!!!!! Clean and very easy to maneuver, I highly recommend. I have a locker on the lower level and it is very accessible via elevator. The staff is very friendly and helpful if needed. You can't go wrong here! Super clean & convenient. Free use of moving truck is definitely a plus. Rt 168 North between Wilson Ave and Brown Ave, Next door to the Goodwill Store. Drive south on N Black Horse Pike. Our facility will be on your left just after Brown Ave.
Drive north on N Black Horse Pike. Our facility will be on your right just after Wilson Ave.
Drive west on E Browning Rd. Turn right onto N Black Horse Pike. Our facility will be on your right just after Wilson Ave.
Drive southeast on W Browning Rd. Turn left onto N Black Horse Pike. Our facility will be on your right just after Wilson Ave.